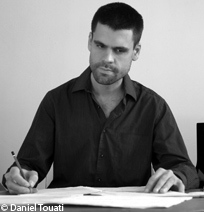 A French composer born August 1st, 1980 in Paris. Florent Motsch studied at the Paris Conservatory, notably with Marc-André Dalbavie and Frédéric Durieux. In parallel he gained a musicology degree from the Sorbonne University, Paris. A laureate of the Beaumarchais Foundation, he has also won several prizes since 2008 and was in residence at the Casa de Velàzquez from 2010 to 2012. He has received commissions from the French State (Cinq paysages avec figures absentes, 2009), from Radio France (El beso, 2012) and from private foundations. Florent Motsch composes chamber music (Nocturne for piano, 2010), music for ensemble (Les formes d’une ville, 2007), for orchestra (Procesiones 2011) and vocal music (Erinnerung for chorus, percussion and organ, 2013). His works are played in Europe, the USA and in Japan. For each composition he attaches particular importance to the harmonic colours and the orchestration, in a relatively French tradition. Les partitions de Florent Motsch sont inédites.